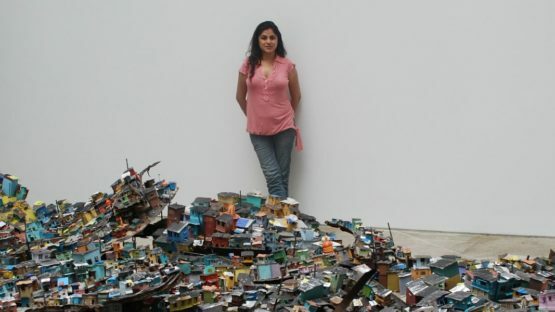 Hema Upadhyay, born Hema Hirani, was an Indian artist, known for her intricate, often political mixed-media compositions and sculptural installations. In her oeuvre which is focused mainly on displacement, personal identity and nostalgia, Upadhyay privileges her own impressions of the urban landscape. 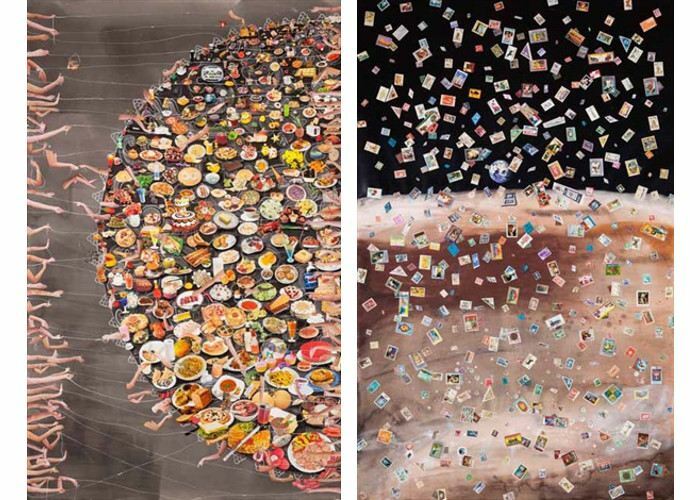 Born in Baroda in 1972, Hema Upadhyay received her Bachelor’s and Master’s Degrees in painting and printmaking from the Fine Arts Faculty of the Sayajirao University. While studying, she met and married painter Chintan Upadhyay. After completing her education in 1998, the artist and her husband moved to Mumbai. The two of them were moving from one flat to another before finally settling in Juhu. City tabloids highly publicized their separation in 2010 and later their divorce proceedings. In many of her works, Hema repeatedly used the landscape of Mumbai and patterned surfaces – such as elements from Indian spiritual iconography and traditional textile design, to reference the repercussions and socio-economic inequalities and issues such as migrations, dislocation and multi-cultural aspects that emerge as a hidden consequence of the relentless tide of urban development in the metropolis of Mumbai. Behind its glamorous projections, Upadhyay strived to show the real face of Mumbai and the reality of daily life for millions of poverty-stricken residents. Upadhyay’s installation Dream a Wish, Wish a Dream (seen above in the featured image) was constructed as a meticulous microcosm of Dharavi, the largest slum in Bombay and all of Asia. 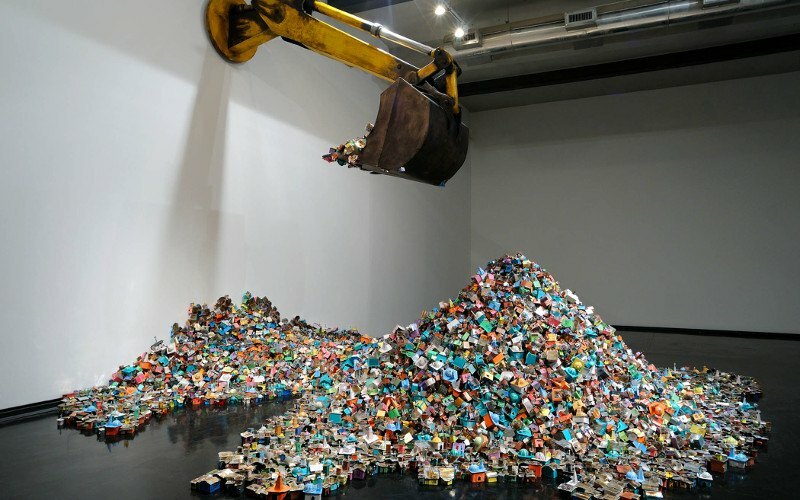 Further developing earlier themes of space, poverty and urbanity, Hema assembled and painted each element of the reconstruction using plastics and hardware materials, with recycled car scraps and aluminum sheets as a ground. As one of the uprising members belonging to the new generation of Indian contemporary artists, Upadhyay was the recipient of a National Scholarship from the Ministry of Human Resources. In addition, she was awarded several times, such as honors from the Gujarat Lalit Kala Academy and the national Lalit Kala Academy for her work in the 10th International Triennial, hosted in New Delhi. Upadhyay has had major solo exhibitions in the United Kingdom, China, Australia and India. A day after they were reported missing, Hema Upadhyay and her lawyer Harish Bhambhani were found dead near a cemetery in Kandivali in the Mumbai’s western suburbs on December 13, 2015.